It is more important to manage human waste, when this is not managed; it pollutes environment with germs and leads to many serious health diseases. Today’s it’s very hard to choose best toilet for someone because of various models & types availability in the market. For choosing best toilets there are several parameters to consider. We check a number of sites in which we see toilet reviews of people for best rated bathroom toilets. From that data base we make an overview on best toilets which will definitely help everyone in searching best rated toilet. Worldwide a number of brands available like Toto & Waterworks, American Standard, Briggs, Crane, Eljer, Gerber, Jacuzzi, Kohler, Mansfield and Sterling Niagara, etc. While rating toilets there are number of parameters to be considered like Price Range, Bowl Type, 1-2 Piece, Water Saving, Flushing System, Clogging, Cleaning, Flush Noise, Height, and Installation etc. Bowl Type:- In modern toilets mostly you can get two types of bowls: elongated or standard round. The elongated bowls are much more comfortable to sit & this gives 2 inches more space. Round bowls take up less room and also are less expensive & generally liked by small space homes. 1-Piece/2-Piece:- In market toilets are available in one or two pieces. A two piece toilet has a separate tank that is installed on top of the bowl. Two piece toilets cost averagely 15 to 25% less than a one piece toilet. In operation there is no real difference between one & two piece toilet.Single piece toilets are usually famous for easy cleaning. Water Consumption:-Often 75% of water is consumed by bathroom and from this percentage 40% is consumed by toilet. Water consumption is a main considerable factor while finding best toilets. Best rated toilets generally reduce the consumption of water more than 25% in a home. Flushing System:-Now in market toilets are available in both Single flush toilet and dual flush systems. In past Single flushing systems was mostly used which consumes lot of water whereas in modern toilets dual flushing systems using which can save lot of water consumption as they have two flushing buttons one with less water for liquid waste and other with more water for solid waste. Best toilet is determined on the basis of its best flushing system . Clogging:- According to latest evaluations it is important to measures waste and flushed water movement in one, two, & three flushes. With best rated toilets, the water flushed out the waste to the end in only with one flush. But poor quality toilets require more flushes even after pressing multiple times. Cleaning:-Water should flows into the bowl from all sides which makes powerful cleaning. One piece toilets usually can be cleaned easily. Noise:-People often concentrate on flushing pressure & water flow. Above then 50% customer purchase toilets after checking water pressure & flushing which helps in keep the bowl clean. But some pressure-assisted toilets make sound like jet engines because they forcefully done their work. So when we check rating of best toilets, noise of flush should be check on priority. Height:-The height of toilet stands is also considered in rating decision. Comfort height toilets are those which meet the standards of the Americans with Disabilities Act. Generally the height of these seats are in range of 17″ to 19″. Comfort toilets are two to four inches taller than regular height toilets. Installation & Maintenance:- Best toilet should have attachment of good quality, with which it can be installed properly and also easy to maintain after installation. General cleaning is requires only for the maintenance of a good quality toilet. Today’s models with a self cleaning nozzle are also available in some brands. We take the best toilet reviews from Consumer Reports & Experts those tested some of the best toilets from famous brands like Toto American Standard, Kohler, and Niagara, etc. American Standard is a well known brand in toilet. This toilet is easy to use & pretty quiet. It has smaller tank which makes the bathroom look more spacious. Anyone who really wants to live with comfort & luxury with spending nominal cost should try this. This is WaterSense certified. With less water consumption this provides high efficiency work done. Product Details: Model No. 2889.216.020, Weight 92 Pounds, Shape & Size Round, Material Vitreous China, Water Consumption 1.6 GPF, Certification WaterSense. Toto is a very famous brand in bathroom products. Toto is a USA based company which is supplying bathroom products in the market since 1917. Toto is only brand that is trusted by people for bathroom products in whole world. 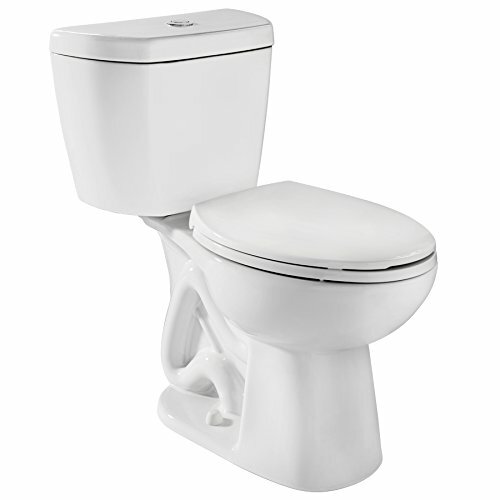 When we talk about “TOTO CST744SG#01 Drake 2-Piece Toilet” this got first rank in best toilet. For high traffic bathrooms this model is always considered best by customers. Product Details: Model No. CST744SG#01, Weight 103 Pounds, Shape & Size Elongated, Material Vitreous China, Water Consumption 1.6 Gallon Per Flush, Type Two Piece. In all high performance toilets champion 4 is known as a leader of the toilets. “4” in product name describes valve size which is a unique feature of this toilet. Big size valve make flushing much effective. This product will move a huge mass even 70% larger than the normal industry standard. Product Details: Model No. 2034.014.020 Champion 4, Weight 119 Pounds, Shape & Size Elongated, Material Vitreous China, Water Consumption 1.6 Gallon Per Flush, Type One Piece. Niagara Conservation Corporation is famous for quality products from last 33 years. Company is well known for conservation products for energy and water. Niagara’s all products are liked for water saving. Niagara 77001WHCO1 Stealth Toilet comes with a unique technique named “stealth”. This technique helps in water conservation. This consume only 0.8 gallon per flush & also gives powerful flush every time. Product Details: Model No. 77001WHC01, Weight 99 Pounds, Shape & Size Elongated, Material Vitreous China, Water Consumption 0.8 Gallon Per Flush, Type One Piece. Installation Type Floor Mounted/Floor Outlet. For choosing best toilets we have to consider a number of parameters like Price, 1-Piece or 2-Piece, Bowl Type, Flushing System & Water consumption etc. After reading toilet review of several products on several websites we have written reviews on top 4 best toilets of best brands. If we have missed any thing from our side please share your views with us.